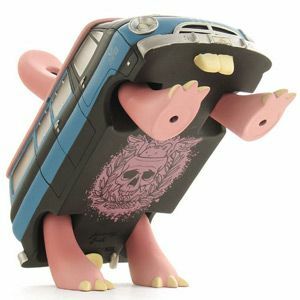 The 1969 Bunnyvan by Jeremy Fish, part of the STRANGEco x Fifty24SF Gallery series. Features Wild Bunny Action and hidden Belly of the Beast Graphic. Godfather of the global army known as the Silly Pink Bunnies, SF-based Jeremy Fish is a storyteller whose tales combine humor, social observations and personal experience through illustration, painting, screenprints, murals, and sculpture. Rotocast vinyl, 7 inches long. Illustrated card box packaging with resealable polybag and sticker. Limited to 600 pieces.